Three item pots, a.k.a. imps, in their completed stages of growth. Item Pot is a feature that goes hand in hand with professions. Both are available at level 30. This feature allows you to grow or evolve a pet-like creature that will reward you if you get it to its full level. If you take care of it incorrectly, it will die. The general rule of thumb is to not spend a lot of money on the imp, but to take care of it effectively (the rewards are exclusive to the Item Pot, but are not worth much). The mechanics are explained below. Item pots are very confusing, and easy to mess up, so know how it works and what it will demand of you before starting. One thing people forget is that unless you are prepared, it requires a lot of time, so if you are going on vacation any time soon, even for a weekend, you should not start growing an item pot. If you get an item pot to its maximum level, the imp will give you an item and then disappear (it will be removed from the item pot). The item you receive is determined by the type of imp you leveled, as well as the closeness value that it had when it reached the maximum level (100 closeness will reward the best items). The Item Pot window can be accessed by opening the Item Pot window (default hotkey is Y). If you open up this window, you will notice one to three slots available (depending on your level). These slots can be filled with item pots (also called imps) or items that affect item pots (these items appear as lamps; see the item section, below). The goal of item pot is to level up an imp to its maximum level (actually, you must level it to its maximum level, e.g. 4/4, and then feed it until it is full) by feeding it Equip or Etc items. The fullness bar on the right begins empty. As you feed the imp, the bar will fill up. It takes about 60 etc items to fill the bar, or 10-15 equips. When the fullness bar fills up completely, the imp will fall asleep for a certain amount of time, depending on the imp. 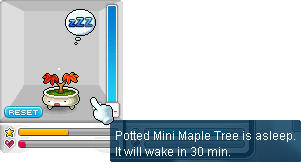 The normal imps, Gemstone Imp and Orange Imp, sleep for 20 hours, whereas special imps such as the Potted Mini Maple Trees sleep for about 4. Fullness bar when the imp is sad. Fullness bar when the imp is sick. Fullness bar when the imp is sleeping. After waking from sleep, the imp will level up. It will be hungry and so its fullness may drop suddenly. If it drops below zero, the imp will go down a level and be sad. Feed the imp until it returns to the level it should be at. You should stop feeding it, if closeness is not full, when it is back to its level and the tooltip, when you hover your mouse over the imp, says something about waiting a certain number of minutes before closeness increases. If it doesn't say anything about the time remaining, then it hasn't returned to normal and you should continue feeding it. The longer you wait to feed it after it wakes up, the more the fullness bar will drop. You can level your imp up all the way without increasing the closeness by very much. If you do this, your reward will not be very good. If you can raise its closeness to 100 before being rewarded, the item will be better. To raise closeness, you have to feed the imp every couple of minutes. For the normal imps, it is once every 10 minutes. If you do this without items, it will take about 17 hours to fill the imp's closeness. Closeness will only increase if there is a closeness point available. You can check to see if a point is available by hovering your mouse over the closeness bar. It will say "Closeness: 1". Closeness points can accumulate past one, but it is rare. 10 Pounding Hearts: 0 wait for closeness points. 9 Pounding Hearts: 1 hour and 40 minutes wait for closeness points. 8 Pounding Hearts: 3 hours and 20 minutes wait for closeness points. 0 Pounding Hearts: 16 hours and 40 minutes wait for closeness points. Not only do you have to wait for closeness, but you will have to wait for your imp to sleep, too! This is the way your imp should be when it is awake and fed correctly. Imps become sad when they are not fed and their fullness begins to drop too much. To cure it, feed it until the sadness is gone. Imps get sick randomly and must be fed medicine (acquired from an NPC in Ardentville) once to cure the status. While sick the imp cannot be fed and will die quickly. Sleeping imps can only be woken up by waiting or by using an alarm clock that faces the imp (if the imp is on the left, use the Alarm Clock (Left)). When fed fully, an imp goes to sleep for a certain amount of time, depending on the imp. 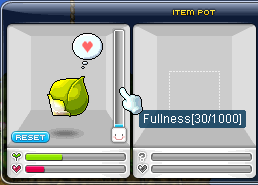 "An atrophied item pot's closeness will not increase until it's grown." - This means that your imp needs to be fed, and may have down leveled by at least one level. Feed it until this message stops appearing. "Temporarily stops closeness from increasing, even when food is given. [Time Left: 3 min]" - This means that your imp has no closeness points available and if you wait 3 minutes you will get one. By feeding it you will increase its hunger, but not increase its closeness. If you don't care about closeness, ignore this. Basically, to use an item pot you have to get an imp, then place it in one of the three slots. You can have three imps at a time, however, it is best to only try and grow one (easy) or two (difficult) at a time. Three is not advised because it will take a very long time to get all of their closeness values to 100. First, acquaint yourself with the Item Pot window and the bars around an imp. To the right of the imp is its fullness bar, which will fill up with blue if you feed it. There are several types of imps. "Req Lev: 30. Raise a cute Gemstone Imp in your item pot by double-clicking this item. Grow your imp by feeding it gear that's similar to your level. It will reward you when it's fully grown!" This is the anniversary imp. It drops from various monsters, including some golems (at Golem Temple) and mud creatures (in the swamp near Kerning City). This imp was available during the 2012 Christmas events. They drop from all monsters. "Req Lev: 10. Double-click on this to put Christmas Socks in the Item Pot and receive gifts. Insert items or equipment from monsters around your level into the Magic Christmas Socks. You'll receive gift-filled socks after 30 minutes." Item pot items can only be found by harvesting. Whenever a player mines or picks herbs, there is a chance that an item pot imp or item will drop. Items allow you to interact with the imps in special ways. There is one item that cannot be found, and that is the medicine, which must be purchased from Ardentville's material vendor (to the left of the exit). creature on the left of the pot after 30 minutes." on the left of the pot to sleep for 3 more days." on the right of the pot to sleep for 3 more days." the creature on the left's likability by 10." left side of your item pot for the next 12 meals." This page was last edited on 26 March 2017, at 20:55.